I’ll be honest. 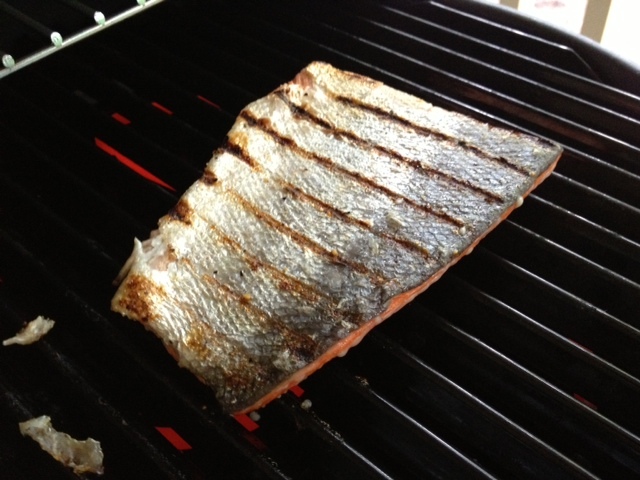 I was really scared to try grilling fish on my electric grill. Don’t get me wrong, the grill has been awesome so far (it’s this Char-Broil one in case you’re wondering—I had trouble getting good recommendations). My chicken has been super moist and juicy, veggies have been great (except the grilled romaine, which we won’t speak of ever again), and my hamburgers were juicy and held together really well. But both times I’ve tried to grill steak, it’s been tough and chewy. So I was understandably scared about fish. See, I luuurrrrve fish. Particularly more “fishy” fish (as my co-worker Lucy would say) like salmon. But dry fish? Blech. I want moist, flaky fish. I’ve tried making salmon in the oven in the past but haven’t had a ton of success getting it to the right consistency. But this grilled salmon was a REVELATION. My mom and I made this a couple days after my surgery, so simplicity was key. I was mostly useless, and cooking in someone else’s kitchen is always hard so we wanted to keep it easy on her. I found this delicious-sounding marinade/glaze on Pinterest and, since I had all the ingredients on-hand, decided it was the perfect thing to try. We were both so shocked by how good it was, how perfect the consistency was, and just how easy the recipe was. I was really sad that we only had two tiny fillets, because I would have DESTROYED, like, an entire salmon if it’d been available. Mmmmm, salmon. Whisk together the rice wine vinegar, maple syrup, and orange juice, pour in a large ziploc bag. Sprinkle the fish with salt and pepper, then put it in the bag. Seal and marinate in refrigerator for up to 3 hours. We only had a half hour to marinate it, and it turned out great. Preheat your grill (or grill pan, if you’re going that way) to medium-high heat and spray or coat with oil or cooking spray. Remove the salmon from the bag, but save the marinade—you’ll need it. 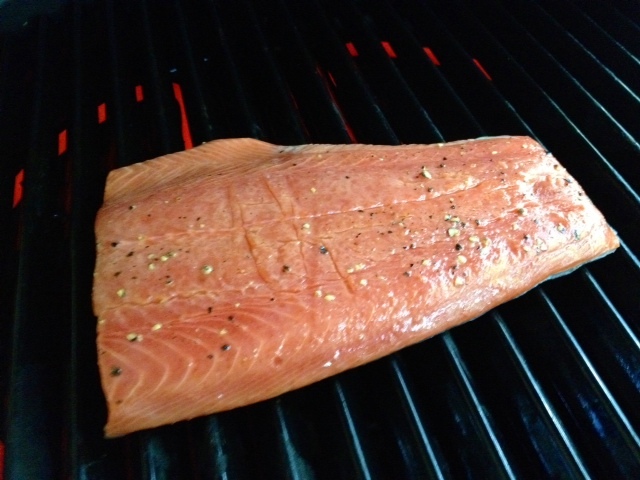 Place the fish on the grill and cook for about 4 minutes on each side. It’s done when the fish flakes easily when you test it with a fork. While the fish is doing its grill thang, pour the marinade into a tiny saucepan and bring it to a low, rolling boil. Cook it until the liquid has reduced to about 2-3 tablespoons. The recipe said 5 minutes, but it was more like 10 for me. Remove the fish from the grill, sprinkle with a little more salt and pepper. Before serving, drizzle with the marinade. It was so good! The fish was moist and flaky, the flavors were fresh and tangy, and the overall effort involved was minimal. 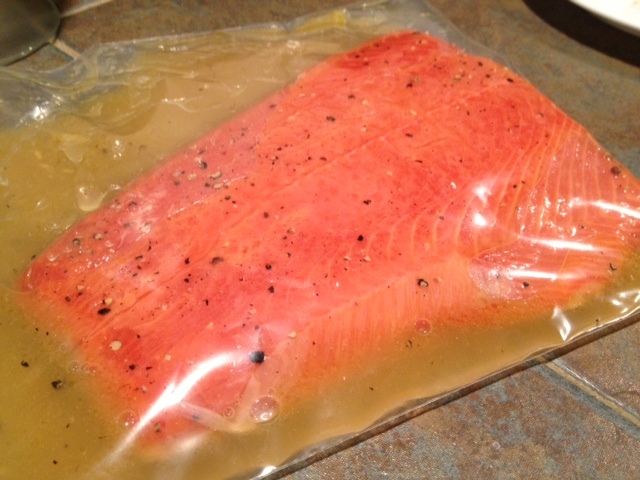 Combine the rice wine vinegar, maple syrup, and orange juice in a large ziploc bag, then add the fish. Seal and marinate in refrigerator for up to 3 hours (we only had a half hour and it turned out great). Preheat the grill or grill pan to medium-high heat. 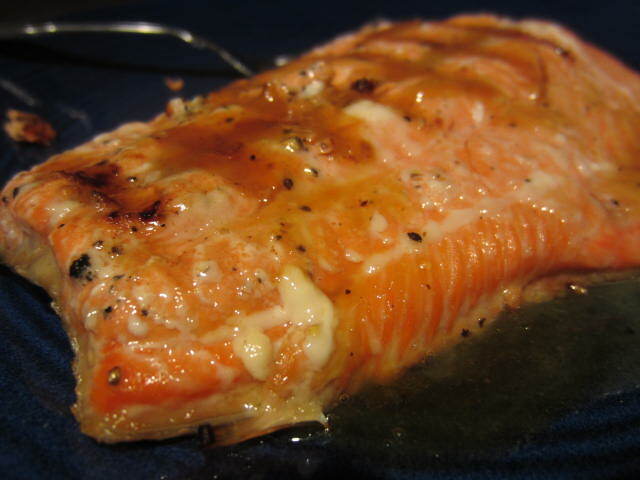 Remove the salmon from the bag, reserving the marinade. 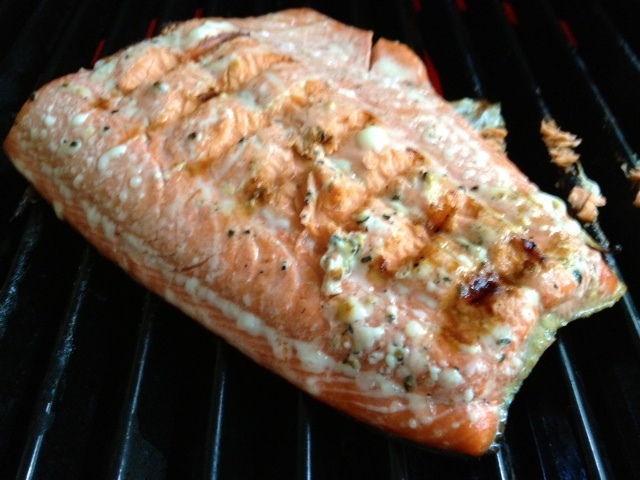 Coat the grill or pan with cooking spray or oil, then place the fish on it. Grill about 4 minutes on each side, until the fish flakes easily when tested with a fork. While the fish is grilling, pour the marinade into a small saucepan and bring to a boil. 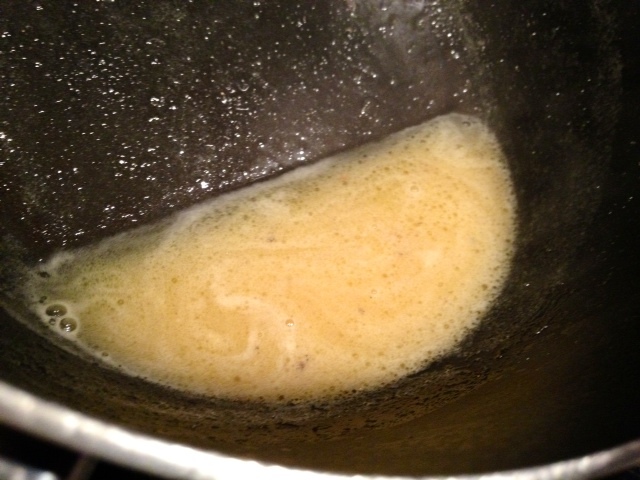 Cook until the liquid has reduced to about 2 tablespoons (about 5-10 minutes). 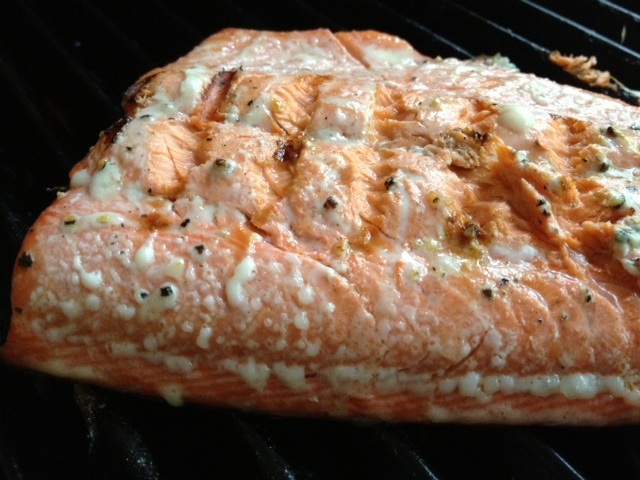 Remove the fish from the grill, sprinkle with salt and pepper, and drizzle with the reduced marinade.